EFTC, now Suntron (NASDAQ:SUNN), is a leading electronics manufacturing services company providing high mix solutions for the aerospace, industrial controls and instrumentation, medical, semiconductor, networking and telecommunications industries. EFTC's two largest customers Honeywell and Allied Signal had merged producing a 70% customer concentration and EFTC had been experiencing heavy losses. The company required liquidity to support a recently awarded 10-year, long term supply contract that would result in 50% increased revenues. M&A Capital pursued all viable capital options to insure that EFTC's board of directors was informed to select an option that would allow EFTC to perform and improve its operating performance with its new contract. 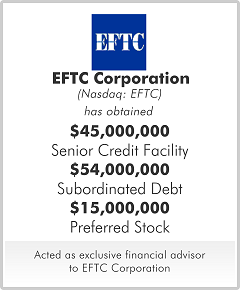 The board selected a structure that allowed EFTC to repay its existing debt primarily through long-term subordinated debt and preferred stock, which resulted in substantial availability under the revolving credit facility.